We are a week into the Olympics and I’m loving it. The Olympics are, in fact, my third favorite holiday. I am an equal opportunity Olympics fan, happily watching whatever happens to be on and rooting for whoever happens to be playing/skiing/swishing/scooting/speeding. But today, I’m all about the cross-country skiing. I haven’t watched any yet and I’m looking forward to the women’s 10 km race. It looks so, so hard and somehow the skiers seem to always be going uphill. On skis. Which are meant for moving downhill since they are long and slippery and not hiking boots. Therefore, since it is exhausting to watch these women exhaust themselves, I am going to have some cheese to keep my strength up! In honor of cross-country skiing itself, invented more than 5000 years ago in Scandinavia, I shall have cheeses from the Great North. Wrångebäck, a hard cow’s milk cheese from Sweden, is a cheese we’ve had a few times, but recently we’ve started getting it younger and less funky. It is still very flavorful, just without as much of an earthy overtone highlighting instead its salty richness. 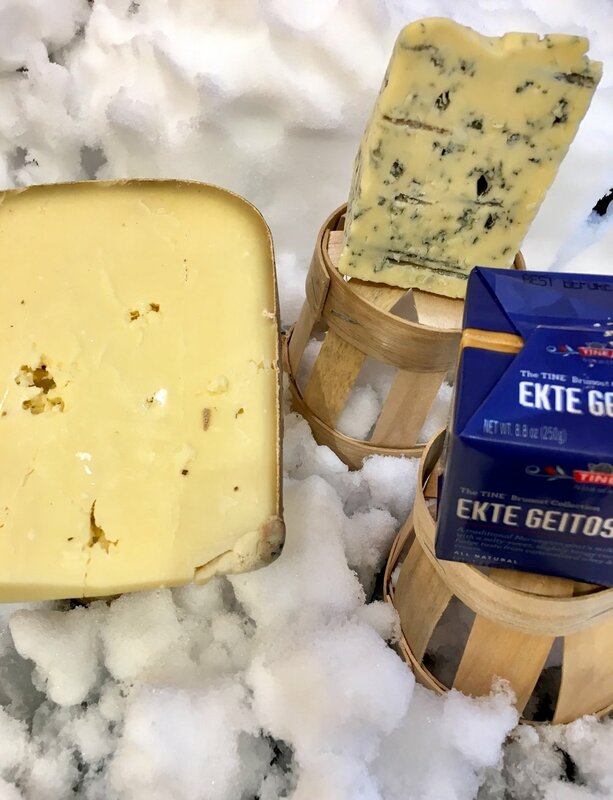 One of my favorite blue cheeses, Mycella, will represent Denmark in my Scandinavian spread. I am a fan of Mycella because it is a Goldilocks blue cheese, not too soft, not too dry, not too strong, not too mild, juuuust riiiight. Finally, the Norwegian Gjetost must be included because it is a classic mid-ski snack in Norway. Rumor has it that it will last for months in your backpack in case you decide to ditch the skis and go hunt elk in the backwoods for a while. However, I will be sitting in front of the TV, so keeping Gjetost or Wrångebäck or Mycella forever will not be a problem I face. Add a nice dark beer, and bring on the cross-country skiing! Skål!